"We need to have new deficits because of that. 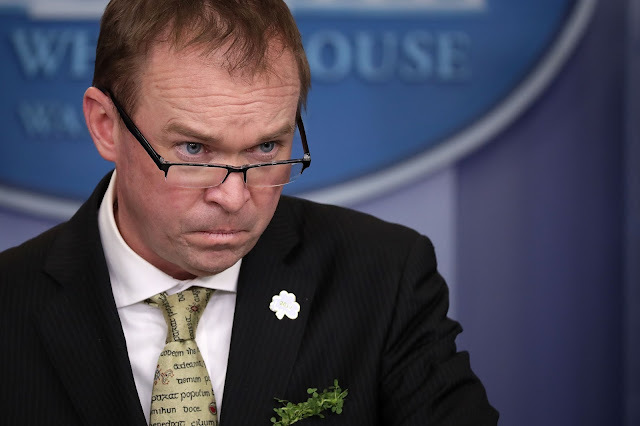 We need to have the growth," Office of Management and Budget Director Mick Mulvaney told CNN. "If we simply look at this as being deficit-neutral, you're never going to get the type of tax reform and tax reductions that you need to get to sustain 3 percent economic growth. no mention by him of reducing government spending to prevent a deficit. "We really believe you can't spend money you don't have," Mulvaney said in his 2010 victory speech, according to The Washington Post. He also previously voted against raising the federal debt ceiling and co-founded the hardline budget hawkish House Freedom Caucus. In other words, he has chosen to be close to power over principle. "Clown" is too nice. This guy is an idiot of the highest order. He has not one scintilla of a clue about liberty, freedom, economics or history. As a South Carolina resident, I was happy to see this guy go. But, maybe it would have been better for him to remain a SC house rep because the damage he could inflict would havr been minimized.